Last week was the fifth anniversary of the outbreak of the global financial crisis. 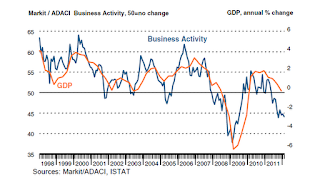 Not uncoincidentally it was also the fifth anniversary of continually rising unemployment in Spain , since it was in early summer 2007 that seasonally adjusted Spanish unemployment embarked on its steady upward path. And after it started climbing, naturally it hasn't stopped since. Indeed we seem to have at least another year of growing unemployment before us, maybe more. Anyway, as if to celebrate this uncanny anniversary the Spanish government has decided to take the bold step of officially requesting an EU loan to recapitalise the country’s banking system. In addition, part of the money will be used to set up some form of bad bank with the objective of cleaning up some of the toxic property and other assets off the bank balance sheets. Smart moves both of them. Pity the people responsible weren't prepared to accept the need to do this five years ago, when unemployment was only running at 8%, and when the economy and Spain's citizens were better placed to accept the kind of burdens that are now about to be imposed upon them. Just to round the commemorations off, in the August edition of their monthly bulletin the ECB finally let out that dirty little secret than every insider in the know has already discounted. The Bank have finally accepted that the much heralded Spanish labour reform isn't going to work. At least not as planned. As the Financial Times put it, the Spanish labour market reform approved in February was “far-reaching and comprehensive” but came too late, the ECB implied, saying it “could have proved very beneficial” in avoiding job cuts if the measure had been passed some years ago. Exactly. But once we recognise this point, isn’t that rather leaving the Spanish economy adrift in stormy seas without a rudder? Simply cutting the deficit back and cleaning up bank balance sheets won’t get the economy back to growth. Indeed this habit of continually getting behind the curve, and trying vainly now that the economy is spiralling almost out of control to introduce measures which should have been brought in a decade ago extends well beyond the issue of labour reform. Take reducing the generosity of unemployment benefits. This is also something that should have been done years ago, since the two year allotment really did encourage people to refrain from actively seeking work in times of relatively full employment. But cutting benefits now, as the Rajoy government has just done, when unemployment stands at 25% and rising seems insensitive and even cruel. A government’s job is to introduce policies to create employment, not to cut benefits going to those who cannot find work in an environment where total employment is falling and has been doing so for five years. Quite frankly, if cuts have to be made, better to reduce pensions, but that is political dynamite, so it doesn't happen. Again, reducing the fiscal advantages of home ownership made mountains of sense during the years of the property bubble, but it didn't happen. Now, with around two million housing units (between finished and uncompleted) needing to be found purchasers removing tax benefits on mortgages, increasing VAT rates on property transactions and raising the local property taxes - all of which make buying a homea lot less desirable - looks very much like trying to shoot yourself in the foot. There is a lot of merit behind the desire to stabilise Spain's public accounts, but shouldn't we also try to remember why the country has this crisis in the first place? Anyway, having recognised that the labour reform comes to late to really change course decisively this deep into the crisis - something incidentally which we much maligned macroeconomists have been arguing all along - what does the ECB propose to supplement it? Well, according to the bulletin "countries with high unemployment also needed to abolish wage indexation, relax job protection and cut minimum wages." Indeed the bank went beyond its usual practice of avoiding country specific commentaries to issue a direct prescription, saying it expected a “strong decline” in wages in Greece and Spain, countries which have the highest levels of youth unemployment in the eurozone, with more than 40 per cent of under-25-year-olds in the labour force out of work. This strong decline in wages does not, mark you, form part of the kind of "internal devaluation" some of us have been arguing in favour of for some years now, whereby a battery of measures are introduced to try and bring down both prices and wages at one and the same time. Not at all. July inflation in Spain was running at 2.2% compared to 1.7% in Germany. Prices in Spain are going up, largely due to all those tax increases laid down in the adjustment measures. Annual inflation will probably surge by around two percentage points in September as the new consumption tax rates fall into place. So it is only wages which are likely to be coming down, and this makes it all feel much more like 1930s type wage deflation than the sort of internal devaluation that has been being advocated (see my January 2009 piece "The Long And Difficult Road To Wage Cuts As An Alternative To Devaluation" as a harbinger of all this). Well, if you let things go to hell for the best part of five years, naturally the patient is in a poor state and in need of radical surgery. I won't say "I hope they know what they are doing," since I am pretty sure they don't. Perhaps I would rather say I hope Mariano Rajoy knows what he is letting himself in for when he asks for help from the ECB. 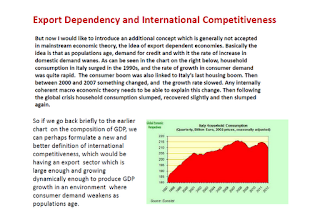 Talking of which, and turning to another of the "troubled" countries, Italy, I see Finance Minister Vittorio Grilli has come out today and confirmed two issues I was conjecturing about in my blog post only yesterday. In the first place he admitted in an interview in the newspaper La Repubblica that it was unlikely the country would meet this years deficit target due to the depth of the recession, and in the second one he confirmed my fear that getting agreement to ask for EU help would be much more difficult than Mario Monti recognised during the press conference he held with Mariano Rajoy at Spain's Moncloa Palace. Italy plans to wait for the ECB to act, and see what the measures look like, despite the fact that Mario Draghi has made it quite clear he will only do so after a request for assistance goes to the EU. 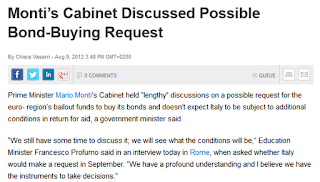 So instead of preparing a “battery of measures” to go to the root of Italy’s problems it looks like we what we may well face is protracted debate about how to avoid making any kind of formal request. The latest idea to surface is that of trying to get ECB agreement for the Cassa Depositi e Prestiti, a state-financing agency controlled by the Treasury and managing some €220bn in postal savings deposits, to be allowed to use its banking licence to secure loans from the central bank in order to explicitly buy government debt. As the saying goes, this one can run and run. 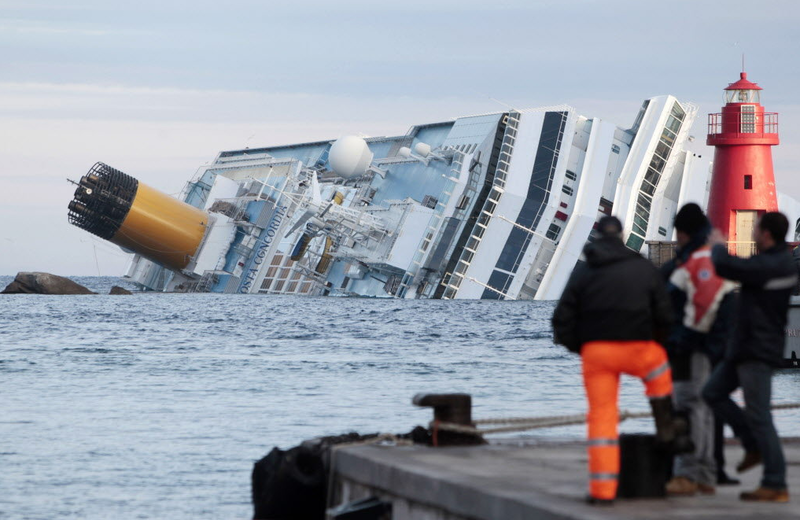 Which all brings me to the main point I have been thinking about all weekend, which is why it is that policymakers find it so incredibly hard to see situations coming, and to take corrective action before the train crash occurs? "One more word about giving instruction as to what the world ought to be. Philosophy in any case always comes on the scene too late to give it... When philosophy paints its gloomy picture then a form of life has grown old. It cannot be rejuvenated by the gloomy picture, but only understood. Only when the dusk starts to fall does the owl of Minerva spread its wings and fly". 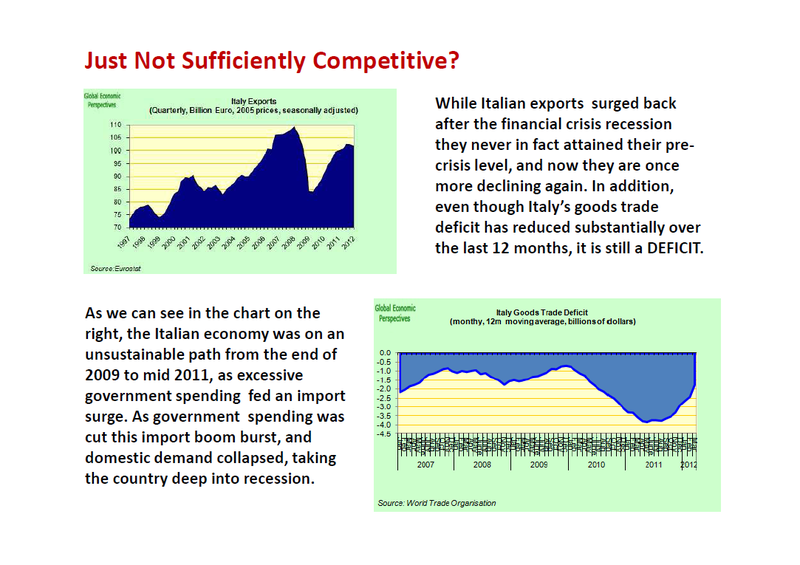 Is The Italian Elephant About To Break Loose Again? Market nervousness about Italy has been growing in recent weeks, with the Moody's credit downgrade of the country being only one of the reasons. A bailout is clearly in the offing, with the only real questions being how and when. While the situation inside his country appears to be deteriorating, Mario Monti has been doing the rounds of European capitals in an attempt to drum up support. While in Helsinki he raised an eyebrow or two when he warned that without a serious plan to bring down interest rates disaffection with the euro in his country could easily grow to dangerous proportions. Crying wolf, or a piece of insider information? Probably a bit of both. Italy is in a deepening recession which has now lasted for over a year. Monti himself has ruled out the possibility that he could continue in office after next spring's general elections, while at the same time Silvio Berlusconi is constantly hinting that he would not be averse to accepting prime ministerial office again, should his country need him. 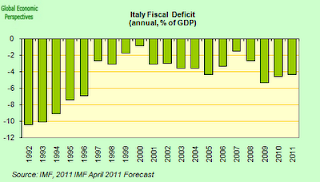 All of which makes me ask myself just over a year after my "Is Italy, Not Spain, the Real Elephant in the Euro Room?" post, whether in fact the currently chained beast is not about to break its tethers and go for a crockery breaking rumble round the Euro living room. 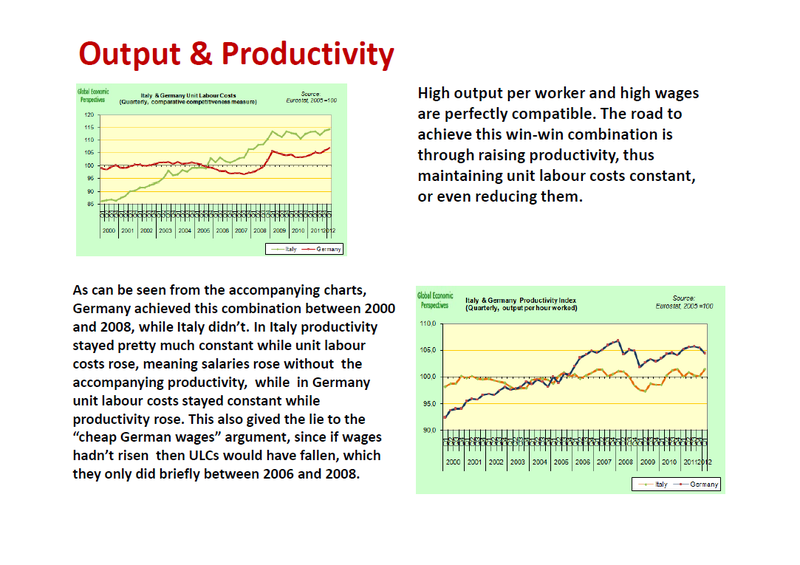 What follows is a summary of a revised version of a presentation I gave in Cortona last autumn. I have put the presentation online here. 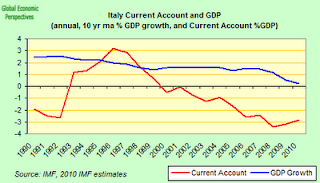 Just as I highlighted in the case of Portugal in my recent post, Italy's problem is long term growth. This is not a passing phenomenon, but one which has been getting steadily worse over decades. 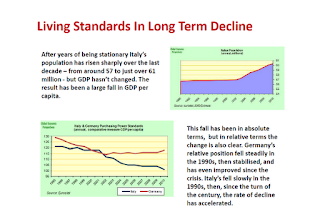 Italy has lost growth at a pace of about one percent a year over the last four decades. 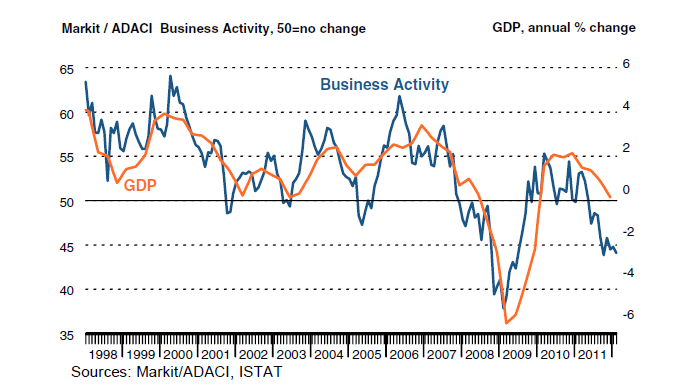 If the pattern continues Italy GDP will drop over this decade and continue to do so for as far ahead as the eye can see. To give us an idea of what this means, Italian GDP at the end of June was at the same level it first reached in the second quarter of 2003. 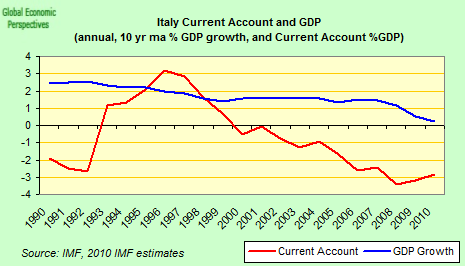 If the current recession continues as forecast by the Italian government during this year, by December we will be below the GDP level of December 2000, which is another way of saying that it will be below the level first attained some 12 years earlier. If the recession is slightly deeper that the current government forecast, and continues throughout 2013 (certainly not an excluded scenario) we might even arrive at levels first seen in the late 1990s. In the meantime the country's population will have risen from 57 million to 61 million, hence GDP per capita will have fallen substantially. This is not a situation either to be taken lightly, or one which it will be easy to turn around. There are a variety of reasons for this sharp drop in growth momentum. Some of the reasons are undoubtedly, as I will argue demographic. Others are associated with the loss of international competitiveness experienced by the Italian economy since entering the European monetary union. Once clear indication of the extent to which the deteriorating growth outlook is associated with cometitiveness loss is to be seen in the correlation between worsening growth performance and the deteriorating current account balance. 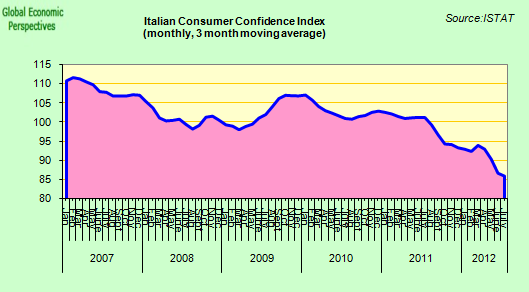 Italy first fell into recession at the end of 2007 – some months before the other Euro Area countries - and didn’t come out of it again till the start of 2010 , so the economy contracted for two full years. GDP fell by 1.2% in 2008, and by 5.5% in 2009. After an 18 month recovery, the economy again fell into a second “double dip” recession around the middle of 2011, after a surge in borrowing costs forced the government to apply stringent austerity cuts in an attempt to recover investor confidence. In the three months up to June GDP contracted for a fourth straight quarter, falling by 0.7 percent over the previous quarter. We don't have the detailed breakdown from the statistics office yet, but it seems clear the contraction was again led by sharp falls in consumption and investment as concerns about the fiscal outlook and the euro area crisis depressed confidence and tightened credit conditions. 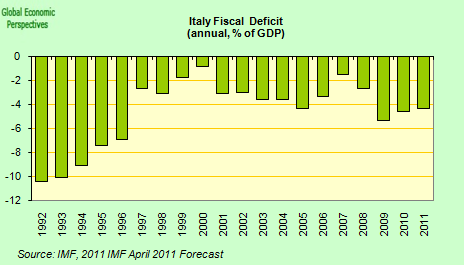 It is quite possible that Italy will experience a deeper recession this year and next than most forecasters predict (IMF current 2012 -1.9%), reflecting headwinds from the sovereign debt crisis compounded by Italy’s large planned fiscal adjustment. The government will likely miss its deficit targets and even in the absence of any major shocks to yields, the country’s debt to GDP ratio is surely going to increase significantly over the next few years. 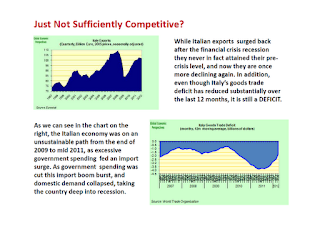 Part of the problem is that Italy's fiscal spending has assumed the importance it has in the country's economy due to the loss of international competitiveness. Reducing the government contribution to GDP in this context only makes the economy fold in on itself. More urgent competitiveness raising issues are needed, ones which will bring quicker results than the ongoing programme of long term structural reforms. 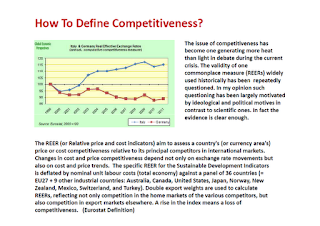 So Just What Do We Mean By International Competitiveness? 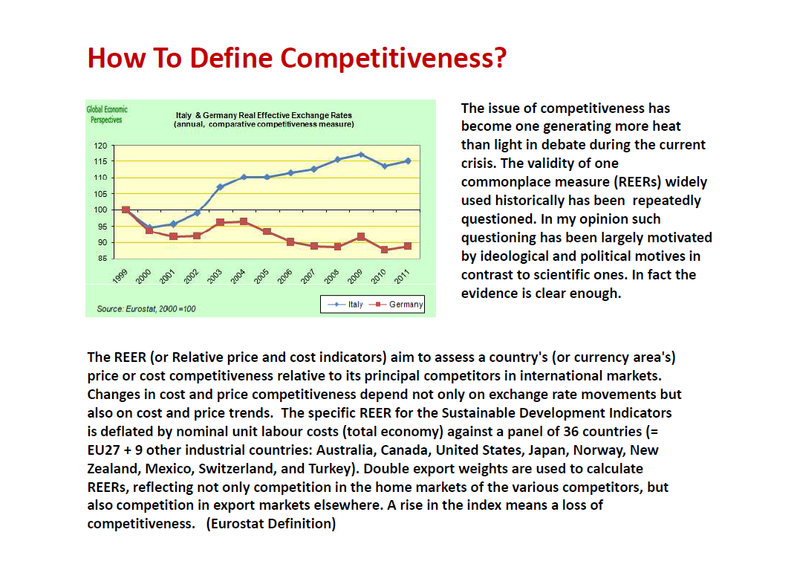 The issue of international competitiveness is the one which has perhaps caused most theoretical controversy during the current Euro Area crisis, with one side arguing vehemently that some sort of devaluation is essential, while the other argues equally vehemently that it isn't. 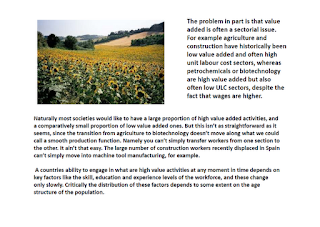 In the follwoing slides I propose a slightly new definition of international competitiveness, which is to do with having an export sector which is appropriately large given the median population age of the country concerned. You can enlarge the slides for easier reading by clicking on them, or alternately you can view them via my slideshare version. 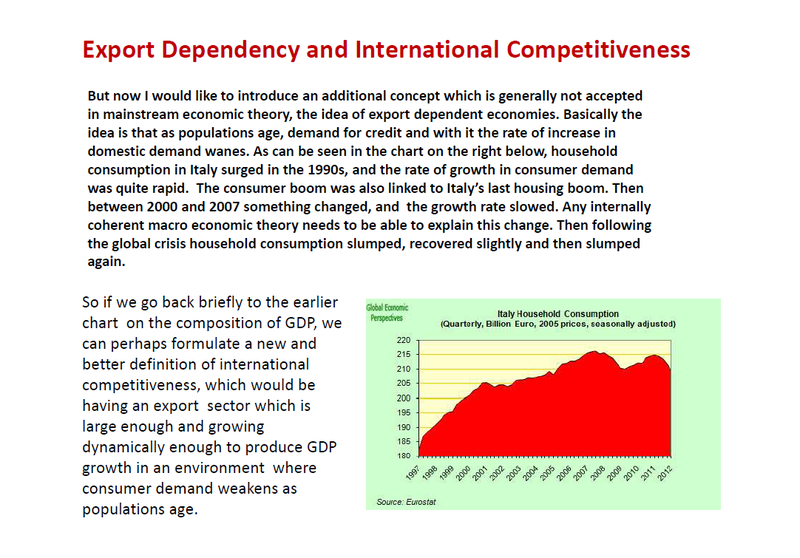 • Export dependency gives a better, more precise measure of international competitiveness. • An export dependent country is internationally competitive when it has a large enough export sector to drive economic growth. 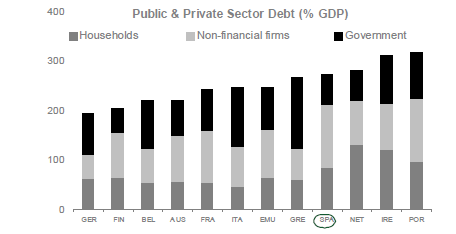 Total Italian debt is not excessive in comparison with some other countries in the Eurozone, but public debt is the second highest. 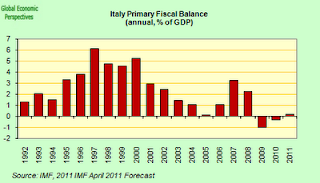 Italian gross government debt to GDP is currently perched just under 123% of GDP. 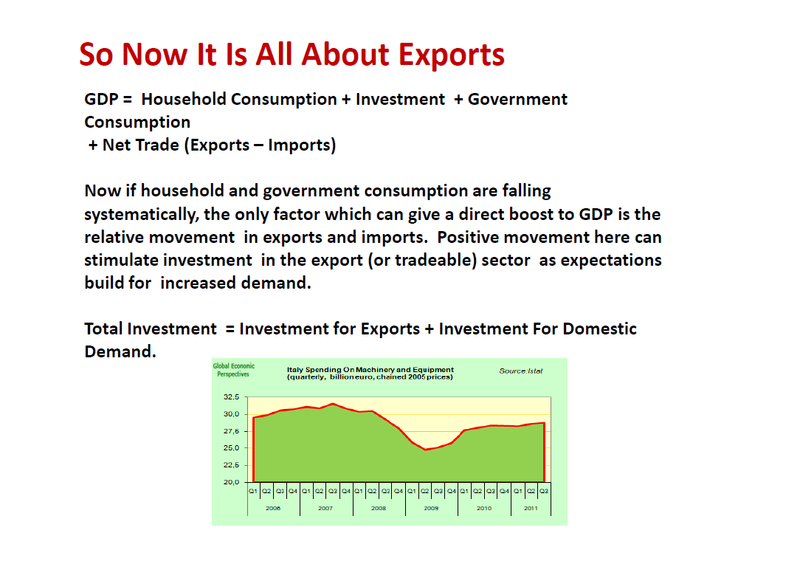 The key factors which will influence the future trajectory are GDP growth, inflation and interest rates. With GDP falling, inflation low and interest rates rising the outlook seems quite problematic. Hence The Problem Of Market Pressure, and concerns about interest rates. Italy is currently paying around 6% for 10 year debt issues, and the average maturity of Italy’s debt is 6.7 years, the lowest level since 2005. The IMF currently predicts that Gross Government Debt To GDP will peak at 124% in 2013. 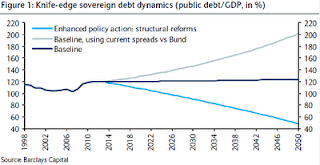 Any significant slippage on this and debt restructuring becomes inevitable. Investors are worried with good reason. Market responses are not just simple speculation. ECB support is critical, but so are radical measures to increase the growth rate. 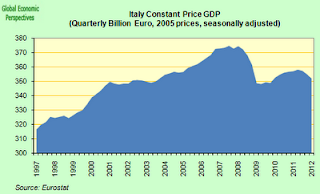 As stated above, Italy shrank further into recession in the second quarter with a 2.5 per cent annual decline. The 0.7 per cent quarterly fall in gross domestic product, only slightly better than the first quarter’s 0.8 per cent decline, means the economy has now been contracting for over a year, and there is at least another year of the same or worse to come as spending cuts steadily bite and the Euro debt crisis rocks its way forward. The recession will weaken tax revenues and hit jobs and consumer spending, a vicious circle which makes it harder for Mario Monti, who is aiming to cut the budget deficit to 0.1 per cent of GDP in 2014, to meet his public finance goals. 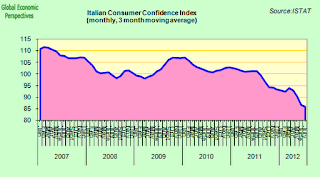 Consumer Confidence and PMI indicators suggest that the Italian government’s GDP growth estimates (of a contraction of 1.2% for 2012 and an expansion of 0.5% for 2013) are way too optimistic . The consumer confidence reading was only just up in July from June's 14 year low, and for the first time since the launch of the PMI services survey in January 1998 firms generally expected output to be lower in a year’s time than current levels. 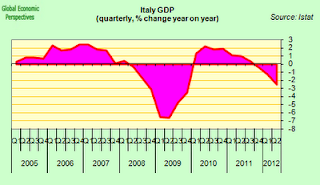 The employers group Confindustria now forecast a contraction in GDP of 2.4% in 2012. 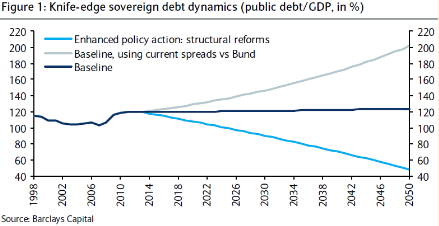 A further fall of 2.0% is not unlikely in 2013 as the European debt crisis worsens. Compared to the other forecasters I would be more negative on the outlook for both private consumption and investment activity. In addition, with a more negative outlook for the euro area economy – destination for 43% of Italian exports — these are unlikely to put in an unexpected stellar performance in 2013. 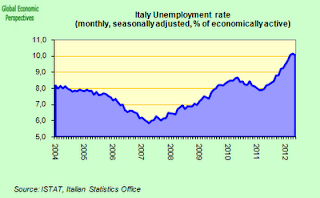 Italy's unemployment rate hit a record 10.8 percent in June, up from 10.6 percent in May. There were 2.79 million people looking for work in June, according to seasonally adjusted figures -- a rise of 37.5 percent compared to a year earlier. Youth unemployment dropped from 35.3 percent in May to 34.3 percent. These are not yet anything like Spanish numbers, but they are not to be sneezed at either. The number of people living in absolute poverty in Italy rose to 3.4 million in 2011, or 5.7 percent of the population, up from 5.2 percent in 2010.Those living in relative poverty for Italian standards were roughly stable at 8.2 million, or 13.6 percent. But among families with no workers and no pensioners, the relative poverty rate rose to 51 percent from 40 percent. The implementation of austerity measures in Italy is likely to have a substantial negative impact on the economy in the coming years. 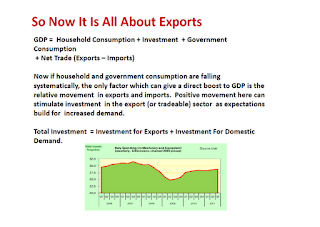 Given its lack of competitiveness, the economy lived off constant demand stimulus from the government. Without this the growth problem is likely to become worse. There have now been five fiscal packages introduced by Italian governments since July 2011, with the objective of a cumulative fiscal consolidation of some 5.2% of annual GDP (€85.8bn) between 2011 and 2014. With the majority of the measures concentrated in 2012, there will inevitably be a large negative impact on the economy throughout this year. Given the deep recession the country will be in over the next couple of years and poor potential growth prospects over the medium- and longer-term, Italy’s public sector balance sheet problems are likely to mount. Although the 2011 fiscal deficit of 3.9% was not particularly high in comparison with many Euro Area countries the governments projection of a close-to-balanced budget in 2014 looks hugely optimistic. A more realistic expectation would be for the deficit to be under the EU 3% level at that stage, but the danger is this could well mean gross debt to GDP will be over 130%. Above the danger mark. The ECB's role in the crisis both helps and doesn't help, depending on how you look at it. They have been very tardy in acting, and normally when they have done so it is been via half measures which have not got to the heart of the problem. The LTROs are a good example. Italian banks have borrowed more than 283 billion euros from the ECB via the 3 year LTROs and other liquidity operations, but this liquidity is by and large used to either purchase government bonds or buy up their own expiring debt. Buying government bonds is attractive since they pay yields which are far above the ECB lending rates. This difference - the so called "carry" - helps bank profitability and enables them to recapitalise, but it also means that interest rates charged to small business clients rises as they need to compete with the government for funds. Despite the fact that such practices make the banks more "joined at the hip" than ever with their sovereigns, and that their exposure to losses should the Italian sovereign eventually have to restructure rises, they remain attractive because the risk weighting and hence "capital consumption" of public sector lending under the Basle rules remains absurdly low. This is where the real private sector “crowding out” comes. 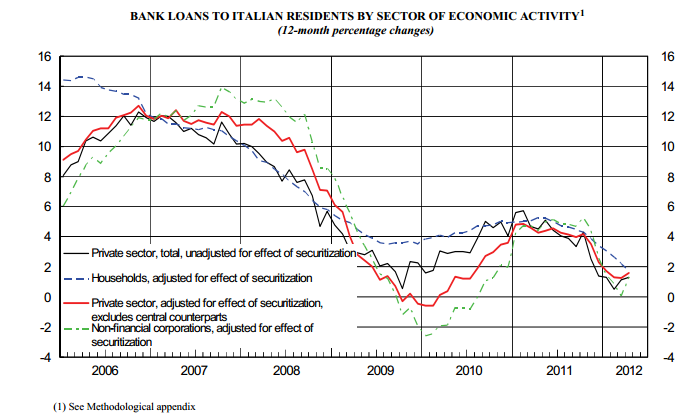 Banks increased their holdings of the country’s bonds by about 78 billion euros in the first six months of 2011. This forms part of the “nationalisation” of Europe’s sovereign debt markets. Foreign investors cut their holdings of Italian government securities by 18 percent in March from a year earlier, according to the Bank of Italy. In the same month Italian banks boosted them by 39 percent. Meanwhile, as we can see in the chart above, the rate of new lending to the private sector has been falling steadily, to both households and corporates. 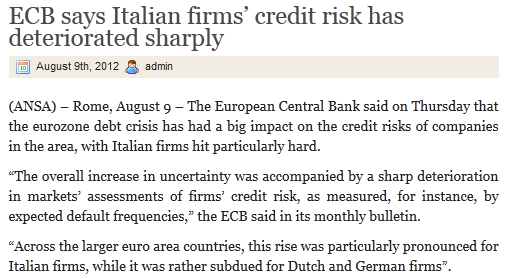 As I say part of the problem is that as the recession deepens the credit risk perception of Italian households and companies deteriorates,as the ECB pointed out in their latest monthly report. The report immediately produced criticism from the Italian consumers’ association Codacons, who complained that the ECB itself had not found a solution to this situation. “If companies are insolvent it’s because banks are strangling them, denying them credit,” Codacons said. 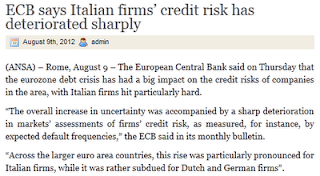 Coldiretti, the Italian agricultural association, also estimates that 60 per cent of companies in the sector risk being starved of credit as they face interest rates that are 30 per cent higher than the average of other sectors. This problem is more complex than it seems. It is not so much a question of credit being strangled, but of demand being strangled as austerity bites. Companies who cannot sell profitably are a high credit risk. 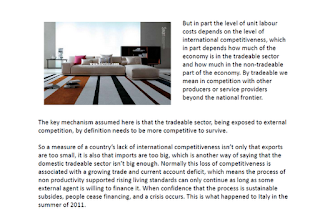 There is demand globally, but as I am saying Italy is insufficiently competitive to take advantage of it. Bottom line, the high cost of financing Italian government bonds is pushing up longer term interest rates, and discouraging investment, and this is an issue the ECB could address, by directly buying commercial paper, for example. The possible Italian bailout is fast becoming a tricky political issue. 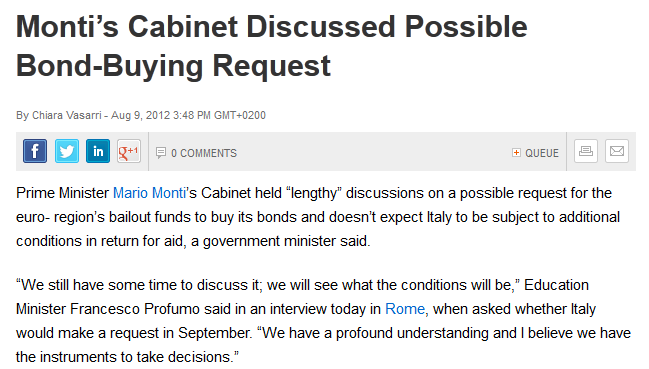 The technocratic government of Mario Monti would like to get an MoU agreed before handing the country back to the politicians. The request for bond buying would involve ECB secondary market purchases as well as primary market purchases by the EFSF. It would also involve a Memorandum of Understanding which would undoubtedly contain strict conditions and an implementation supervision mechanism. The ECB would surely also have a say in those conditions if bank bond purchases were to form part of the package. Indeed, the ECB has only this week in its August bulletin made clear what it thinks is required. The Bank suggests countries with high unemployment need to “abolish wage indexation, relax job protection and cut minimum wages”. The bank is not impressed with the Italian labour reform, which is too little too late, and thinks direct wage cuts are now the only workable remedy. Unsurprisingly, many Italian politicians are highly reticent about being seen to hand over their country’s future to an institution with such views, which if implemented would be massively unpopular in the country, so pressure is mounting for Monti not to ask for help. That having been said, the country really has no alternative if it wants to stay in the Euro. 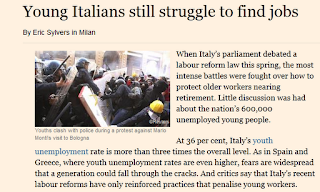 Is Italy Facing A period of Growing Political Instability? 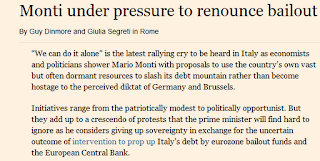 But this is just it, exactly how committed is the Italian political class to staying in the Euro? Certainly it is the one country on Europe's periphery where you can hear speeches from politicians with serious followings questioning whether there are not alternatives. Indeed Mario Monti warned on just this point during his recent Helsinki visit. "I can assure you that if the (bond yield) spread in Italy remains at these levels for some time then you are going to see a non euro-oriented, non fiscal-discipline-orientated government taking power in Italy," he said. He was, of course, referring to the ambivalence of Silvio Berlusconi on the Euro issue, and the outright hostility to the common currency displayed by the rising (5) star of Italian politics, Beppe Grillio. 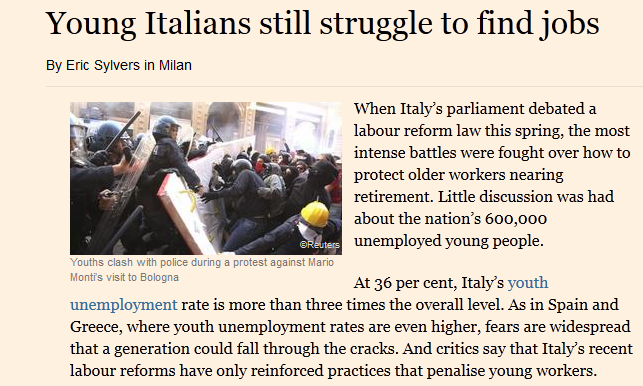 “After me the populists”, as Monti once said. A lot of these statements can be read as brinksmanship, but as BofA Merrill Lynch foreign exchange strategists David Woo and Athanasios Vamvakidis warned in a July 10 report, investors “may be underpricing the possibility of voluntary exit of one or more countries” from the currency bloc. And these countries may not be the ones most widely talk about, like Greece or Spain. 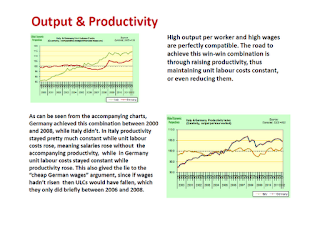 It was Italy, the euro area’s third-largest economy, which they found would enjoy a higher chance of achieving an orderly exit than others and would stand to benefit from improvements in competitiveness, economic growth and balance sheets. Woo and Vamvakidis employed a variant of game theory and found that while Germany could “bribe” Italy to remain in the bloc and avoid the fallout from an exit, its ability to do so is limited. That’s because Italy has more reasons than Greece to leave so any compensation could become too expensive for Germany and Italians may be even more reluctant than the Greeks to accept the conditions for staying. Interestingly enough in this connection Nomura's Jens Nordvig and Nick Firoozye (whose excellent work on Euro break up dynamics unfortunately did not win them the Wolfson Prize) argue in their afterthought essay (Wolfson: What we learned about the future of Europe, Nine specific lessons from the Wolfson Economics Prize competition) that one of the things they learnt from doing the spadework was the following. "We have constructed a data base of the relevant liabilities for each Eurozone country, and our calculations show large relevant external liabilities in Greece, Portugal, Ireland and Spain. This analysis highlights that currency depreciation following exit from the Eurozone would substantially increase the external debt burden of these countries...."
"Meanwhile, we note that estimated balance sheet effects following exit in the case of Italy and France, are substantially smaller than in other peripheral countries, mainly as a function of the prevalence of local law obligations (which can be redenominated) within external liabilities. It follows that policy makers and investors should pay close attention to the size of balance sheet effect (not only to standard competitiveness and the trade effects) when thinking about the macro impact of specific exit scenarios". 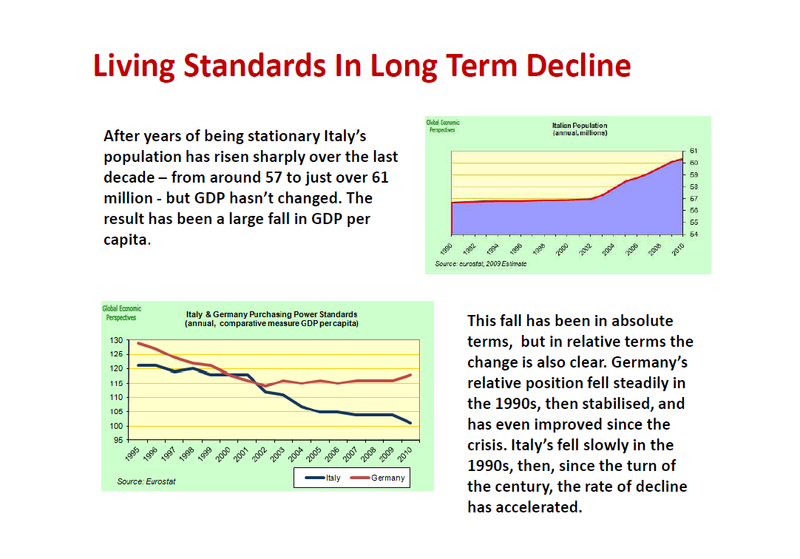 So, summing up briefly, while the Monti Government’s structural reforms are obviously a step in the right direction it is unlikely they will go either far enough or fast enough to significantly lift the country’s potential growth rate from its present lamentable level. Further, as the April 2013 election approaches the growing popularity of new political movements like Beppe Grillo's Five Star one could easily lead to the kind of political fragmentation already seen in Greece - Italy has hardly been a model example of the two party system - making the traditional political forces which back the Monti Government even more reluctant to accelerate the adoption of far-reaching reform. And going beyond April, the political arithmetic of a post Monti government looks complicated, making the kind of stability needed to advance what the population may well see as "harsh" reforms unlikely. 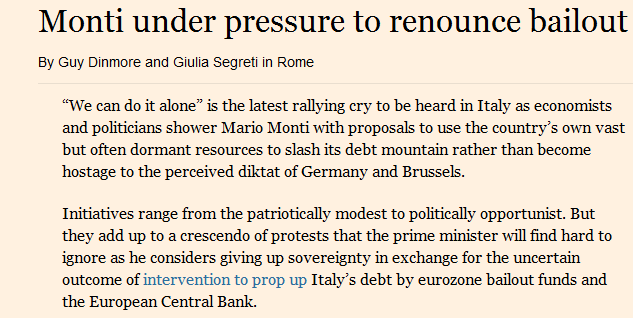 In other words, as Monti says, when I go watch out for the populists!